I just finished my French homework. I just printed this out. It's going up in my room until my time machine is built!!! 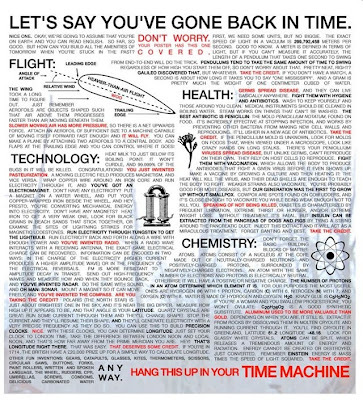 lol i like that its so informative but somehow entertaining :)when i invent a time machine i will deffinatly hang that up1!! Really funny but if someone from the past read it they would have no idea what it was talking about. To do the things it said you need to have or understand other things that are only known now. TrueDragonMaster: I think that advice would be particularly good for ladies from the past. We invented tons of stuff--and let other people take credit for it! That is so cool! I'll definitely but that when i get my time machine up and running...haha. I'm so happy the weekend is here! My past week has been exhausting! I'm a part of Model UN at my school, and I can't find ANYTHING on my topic! Darn you Djibouti! i greatly disliked the model UN thing. it was so boring. Have you ever done a post on Voodoo Donuts? You should. I will create a time machine from an Altoid's tin and Elmer's glue, and it will send me galloping through time at a rate of 60 seconds per minute! Anonymous weekly bloggers- i am!!! Does anyone ever save their homework...especially big projects...to the last minute? I do frequently. It's kind of a problem. Anonymous: Hmmm..... Kinda off topic here but, ah oh well. I do! I'm always pressed down to the last minute. You know why?? I have other stuff to do, thats why. You just have to devolp a schudule to fit you're time. Like I do my homework when I get home and I study after the simpsons at 7. For projects you just have to work on a little bit a day.